When we started tearing out the rotten guts of the barn for renovation, we were able to see for the first time some of the old woodwork laid bare to light for the first time. The beams that support the roof would have been previously visible only if you were on the upper floor, and the flooring wasn’t strong enough to support weight. What we discovered, other than the beautiful old structure itself, was the signature of whoever made it on one of the lesser beams. I can’t make out the name, but I love the fact that it’s there, and that it will remain there for as long as that roof is over our heads. I wonder how long signatures will last. How long it will take for iris scans and digital passwords—minimum 8 alphanumeric characters—to wipe out the need for that flourish which is as individual as each of us. Without paper, where do we sign? If there are no credits to roll after the show is over, who takes credit and when? I can’t help but think, too, that if we had to sign everything we did, it might be better. If we had to take credit, openly and clearly, every time we put something out into the world for the consumption or use of other people, would we be more careful? Would we make it better? More beautiful? More delicious? I’m not talking about self-promotion here. Far from it. 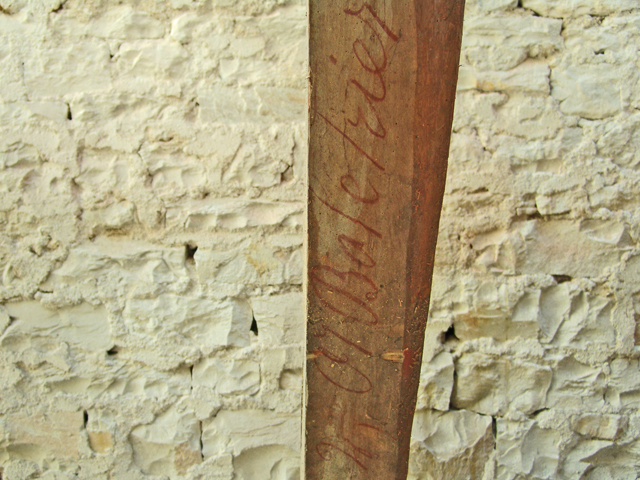 This man’s signature was on a beam, tucked up in the roof, in the shadows. It wasn’t placed there out of egotism, I’m sure, but out of pride and correctness. Assuming no foul-play with photoshop or other means of forgery, a signature means so much: I made this. I am responsible for this. This work—no matter where it ends up—is mine. This entry was posted in FRANCE, IN THE HOUSE and tagged signature, woodwork. Bookmark the permalink. How wonderful to have found this signature. You must have been thrilled. I would love to know who left it there. Marvelous! His name, I believe, is H. Arbaletrier, which meant crossbowman in the Middle Ages. I wonder if any of the family are still in the area? Wow. Now that is great to know. Yes, I thought the name was something like that, but I wasn’t quite sure. What a great meaning for the name of someone who worked with beams and cross-beams. Perfect. and they’ve quit teaching cursive writing in schools here. sad….in so many ways. You are KIDDING me!!! But I know you’re not. I can’t believe that. Back when this signature was placed there, I believe it was the custom for the carpenters to sign their work and you very often find a signature like this on the beams of ancient buildings, homes and monuments in France. e métier de charpentier recouvre tous les métiers du bois de fuste (de construction, opposé au bois de chauffe) qui participent à la construction des cathédrales, des églises, des forteresses et des maisons à pans de bois en réalisant les charpentes, les moules de voutes ainsi que les échafaudages et les appareils de levage : grues, roues à écureuil, etc. Le maitre-charpentier est alors autant architecte qu’Œuvrier (mot qui se transformera en ouvrier) et travaille avec le maître-maçon et le tailleur de pierre. – les charpentiers de la petite cognée, pour ouvrages de moindres dimensions comme les coffres et les bancs (xiiie siècle). Ces derniers s’étant spécialisés dans la fabrication d’ouvrages plus petits, lorsqu’ils fabriquaient des portes plutôt que des portails ou portes monumentale (tout ce qui concerne les huisseries),on disait qu’il s’occupaient de la menu huisserie (qui deviendra menuiserie). l’arbaletrier est une piece importante de la charpente . donc la poutre porte ce nom ecrit dessus pour que le charpentier sache à quoi elle va servir..
Michèle, je ne disputais pas le nom propre ni le terme ‘arbaletrier’; je disais simplement que les charpentiers laissaient leur signature sur leur travail. Donc il se peut que ce soit comme vous dites une désignation, ou bien la signature du travailleur… c’est tout. As to why the other ones aren’t labeled, I have no idea. Why does my daughter’s house in Oakland have a boarded up window in the cellar that says “fenêtre”? The wonderful mysteries of what was, I guess. I certainly can relate to the stumbling around trying to figure it all out and, one of these days, will write a hilarious book about my mis-adventures in foreign countries. Keeps me humble, at least.